Somalia (Somali: Soomaaliya; Arabic: الصومال‎) is officially the Republic of Somalia (Somali: Jamhuuriyadda Soomaaliya; Arabic: جمهورية الصومال‎). It was previously known as the Somali Democratic Republic. It is shaped like the number seven. It is a country in the Horn of Africa. It is bordered by Djibouti to the northwest, Kenya to the southwest, the Gulf of Aden with Yemen to the north, the Guardafui Channel and Somali Sea to the east, and Ethiopia to the west. Someone from Somalia is called a Somali. Somalia is a republic governed by a federal administration with various regional administrations governing on a micro level. Somalia is an independent country. Since the Somali Civil War in the 1980s, there has been no working government that covers all of Somalia; instead, different clans have been fighting for control. Somalia is now trying to gain control of their people and get back up on its feet with very little resources. Visitors from as far away as China visited Somalia, such as Zheng He. The Kingdom of Italy had just come together as one country around this time, and wanted the same things that the other big countries had, like colonies. Italy offered to buy the rights to the east Africa coast from Oman, who was in charge of protecting the cities and small kingdoms there, and Oman agreed. Italy made deals with some of the larger kingdoms/sultanates (like the Sultanate of Nugaal) for them to be under Italian protection, but the smaller ones Italy just invaded. 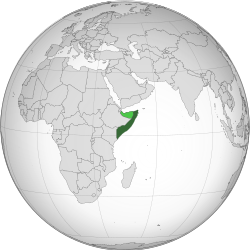 This became Italian Somalia in 1905, with capital Mogadishu. Italy created a colony around Mogadishu and enlarged the territory of Italian Somalia after WW1 with the areas south of the Juba river. In the next 20 years the Italian colony grew in importance, having at Hafun the biggest salt production in the world and in the Scebeli river a huge production of bananas exported to Europe. In 1928 was created the first airport in Somalia's capital and later in 1939 was started the longest air route in Africa with the Linea dell'impero, a flight between Rome and Mogadishu. In 1960 both British and Italian Somaliland declared independence together as the Somali Republic. It was chosen the Latin alphabet for the Somali language. Many areas where Somalis lived were still part of Britain, Ethiopia and France. Somalia wanted to get back all the areas that had been colonized by the French, Ethiopians and British. Somalia and Ethiopia had a short war in 1964 over the Ethiopian part of Somalia, and it was obvious that more fighting was to come. The United States of America and Ethiopia was alarmed by this takeover, so Ethiopia invaded southern Somalia in 2007 and put a new government in power that was made up of the rebel groups that Ethiopia had funded 15 years earlier. Almost everyone disagreed with this decision, and that same year a rebellion against this new government broke out in Mogadishu and spread across the whole country by 2008. At around the same time, Somali pirates kidnapped westerners from big ships for ransom. ↑ 3.0 3.1 "Somalia humanitarian and development statistics" (PDF). United Nations. 1 July 2014. Retrieved 20 June 2016. This page was last changed on 22 December 2018, at 14:44.